Cholesterol is a lipid, or type of fat. It helps the body perform many normal functions. Cholesterol is made in the liver and carries fats in the bloodstream. In the body, cholesterol forms fat-protein chemicals called lipoproteins. Lipoproteins are grouped as very low-density lipoproteins (VLDLs), low-density lipoproteins (LDLs), also known as “bad cholesterol,” and high-density lipoproteins (HDLs). 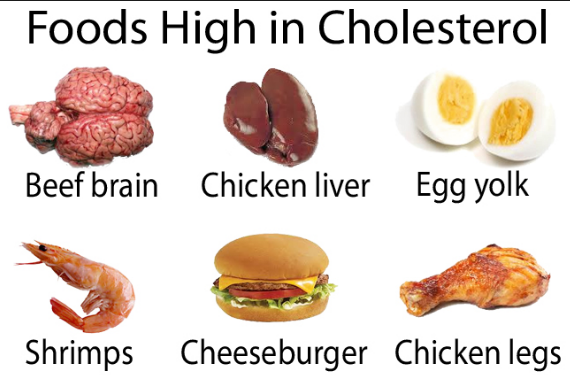 HDLs, “good cholesterol,” help remove lipids from the bloodstream, so higher HDL levels are better. VLDLs and LDLs can clog arteries. High levels of cholesterol, LDLs, and triglycerides (fatty substances) increase the risk for hardening of the arteries (atherosclerosis) and heart disease. What Are the Causes and Symptoms of High Cholesterol? Causes of hyperlipidemia include a family history, high-fat diet, being overweight, certain illnesses including diabetes, and some drugs. Most people have no symptoms until their blood vessels are nearly closed or become clogged. Some people may have small fat deposits under the skin when lipids are very high. Blood levels of cholesterol, HDL, LDL, and triglycerides are measured. Preferred levels are less than 200 milligrams per deciliter (mg/dl) for cholesterol, less than 150 mg/dl for triglycerides, and over 40 mg/dl for HDLs. Recommended LDL levels are less than 130 mg/dl for most people but much lower (less than 70 mg/dl) for those with heart disease and diabetes. Diet is the best way to reduce lipid levels. Lifestyle changes should reduce consumption of saturated fat to less than 7% of calories and cholesterol to less than 200 mg/day. Weight loss, exercise, and avoiding smoking are also important. 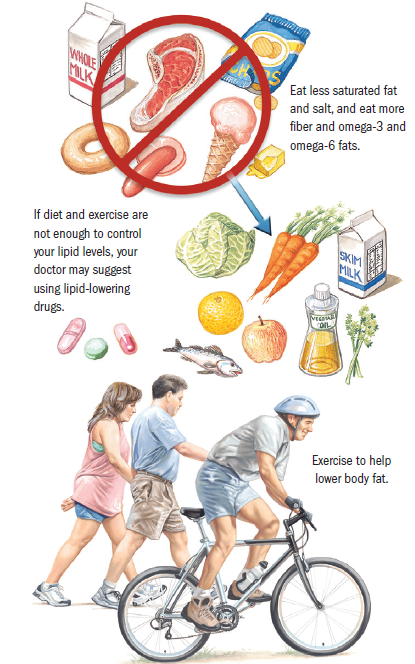 Lipid-lowering drugs are used when diet and exercise are not enough. The main classes of drugs include statins, fibrates, nicotinic acid, and omega-3 fatty acids. Statins (e.g., simvastatin) reduce cholesterol and LDL production. They are effective, usually well tolerated, and preferred for higher cholesterol and LDL levels. They can have side effects such as muscle aches and liver abnormalities. Fibrates (e.g., fenofibrate, gemfibrozil) help removal of VLDLs but have a small effect on cholesterol. Nicotinic acid helps lower VLDL levels and increase HDL levels. Side effects (itching, facial flushing, liver problems) limit its use. Omega-3 fatty acids (over-the-counter fish oil supplements) help patients with high triglyceride, low HDL, and moderate cholesterol levels. DO eat more fruits and vegetables and high-fiber foods such as oat bran. Cook with oils high in polyunsaturated fats such as safflower, sunflower, and corn oils (omega-6 fatty acids). DO eat fish (fish oils contain omega-3 fatty acids). DO lose weight by changing your diet and doing aerobic exercise such as walking, jogging, bicycling, or swimming. Exercise at least 30 minutes a day, 3 or 4 days a week. DON’T forget to treat other medical conditions. DON’T forget to take your usual medicines. DON’T change your diet or medicines without your doctor’s approval.